Country hideaway for two. Tranquil setting, wonderful views, pool. Inland Andalucia near Casares. Convenient beaches, golf, sightseeing. 1� hr Malaga, � hr Gibraltar. 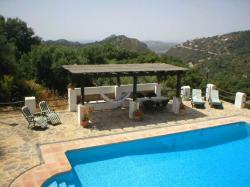 Why not escape from the hustle and bustle of life to find peace and tranquillity in our Andalucian country hideaway? This recently completed ground floor apartment, surrounded by olive and chestnut trees, on a hillside just outside Casares, is a perfect place to relax in the sunshine by the pool, admire the views and get away from it all. An ideal retreat, Arcos Verdes is surprisingly convenient for the picturesque local beaches, and is also a popular base for golfers and sightseers, as well as bird watchers, walkers, cyclists and painters. Situated in the beautiful hills of La Celima, on the ground floor of the owners� private villa, this self-contained apartment for two people offers a perfect escape from the world; the only sounds to break the silence are the songs of the birds and the tinkling of sheep and goat bells. Views of the mountain are wonderful and on clear days the Rock of Gibraltar and the North African coastline are clearly visible. If you want to venture further afield, Estepona and long golden beaches are 15 minutes by car, with a dozen championship golf courses 20�30 minutes away, including Valderrama - the Ryder Cup venue. 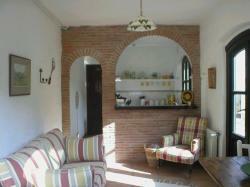 Arcos Verdes is also an ideal base to explore historic Andalucia. The lovely pueblo blanco of Casares is just up the road, with Ronda, Granada and Seville all within striking distance. Gibraltar too, is easily accessible by the new motorway. Arcos Verdes, so called because of the recurring green arches in the apartment, is beautifully furnished and equipped with everything you need for a perfect holiday. 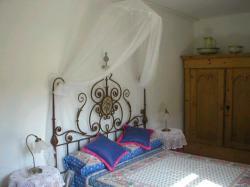 It consists of a lounge/ diner, kitchen and large double bedroom with ensuite bathroom. With its own entrance, terrace, BBQ area and garage, your privacy is assured. Use of the owners� large pool and sun beds etc is included and you are welcome to laze away the days by the pool or explore the magnificent countryside, as you wish. For comfort in winter, the apartment has central heating installed, creating a perfect all year round base for a rural holiday in Andalucia. 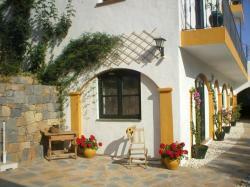 Arcos Verdes is approximately 1� hours from Malaga or � hour from Gibraltar. There are numerous small shops and bars in the nearby village of Casares and many excellent restaurants and ventas in the area - wayside restaurants serving traditional Spanish food. A car is essential as we are 1� km up a track winding round the hillside � but to arrive here is to find the idyllic hideaway you yearned for! !